about pens, inks, stores, companies and the pleasure of writing with a pen of choice. There is so much to see in Rome. 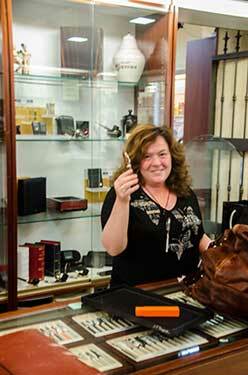 For a pen enthusiast a visit to Novelli Pen & Pipe should be on the list of things to see. Novelli is a great pen store. The store carries both regular and limited edition pens from all the major brands. Novelli has been established for over 35 years and has a solid reputation. I hear on a regular basis excellent reviews from those who have visited the store. Marco and the staff, including Miki and Derek all speak English so for those who speak little Italian, it is easy to talk about various pens and writing preferences. The store has wall cases along one side that display a wide range of pens. There are some floor counters and a counter along the opposite wall. And, if you don't see a particular pen do ask. Trays of pens from the back room will be brought out. Many of the pens that I see in pens magazine ads, I get to see and hold when I visit Novelli. The store is located off the main street ,Via del Corso, just up from the Piazza Venezia and very near the Piazza S. Apostoli. 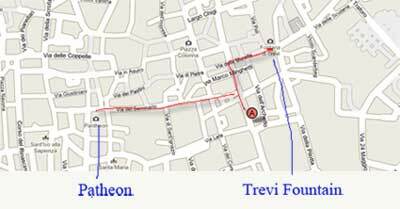 It is also very near the Trevi Fountain, so while the store is on a quite street, it is centrally located and easy to find. See my notes that follow. I have been going to Novelli pen for over 15 years. 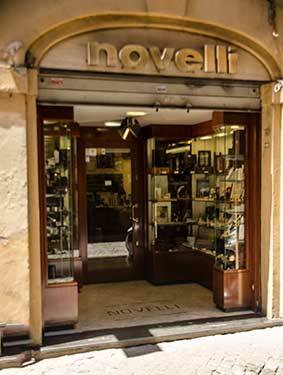 We travel to Rome frequently and a visit to Novelli Pen is always on my list of things to do! At right: Glenn and Marco at Novelli Pen & Pipe, June 2012. Glenn is trying out the Delta Re-Discover Pompei fountain pen. It was in 1997 that I enjoyed meeting Marco's father, Augusto Parascenzo. He showed his large collection of current, limited editions and vintage pens. We talked about pens and enjoyed a great lunch at a nearby restaurant. His wife, Giusy, trained by pen companies on the repair of pens and assists with any adjustments to a pen required. When Augusto passed away Marco and his sister Sabrina continued with the business. I have visited the store almost annually. Marco and Sabrina and the staff run a great shop. On many days Giusy is there, and with my most recent purchase, changed a nib so that I would have the perfect pen. Novelli , the always have a bottle of ink ready so that you can try the nib... a point on which far too many pen stores fall short. Right: Derek King has joined Marco at Novelli to help customers in selected a pen right for them. As I look back over the many years that I have visited and shopped at Novelli, I have concluded that many of my best pens have been purchased at this store. My Waterman L'Etoile, Montegrappa Extra, Stipula Etruria, Omas Paragon in Saffron Blue, Omas Bologna Line Burkina, the new Omas Paragon, Arte Italiana Arco Celluloid and Montegrappa Extra Green Marble, OMAS 360 Vintage Red, Delta Re-Discover Pompei -- are all from Novelli. Many of these have become part of my Pens of Note. 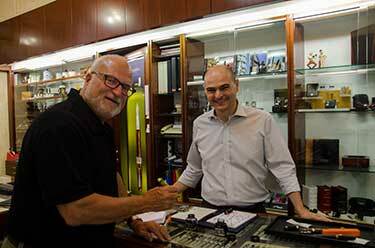 Right: Mikki has worked with Marco for a number of years and can help you with selecting a pen. Pick up a pen, and a bottle of ink is brought out, your pen is dipped and you can try it out. There are so many stores that have watched me hold a pen and never bring out the ink to let me write with it. This, after all, is what the pen is all about. Novelli is open Monday to Friday from 8:30 am to 2:30 pm and from 4:00 pm to 7:30 pm. Saturday is is open from 9:30 am to 1:00 pm and 4:00 pm to 7:30 pm. The store is closed for the month of August.